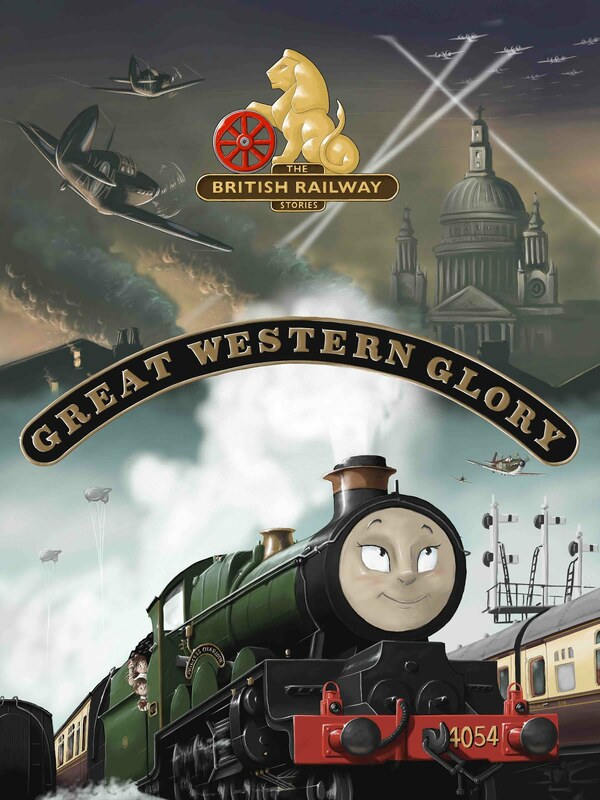 THE BRITISH RAILWAY STORIES LTD: "Thompson A2/1 from a V2?" An alternative title for this blog suggested was "Simon is mental Part 508". I have a boatload of older Bachmann V2 bodyshells. I bought up a job lot some years back to nab spare parts from. This particular one has sat on one of my shelves for about six years now. I decided to have a go at cutting the smokebox off, with the original intention of adding a Hornby A3 smokebox and boiler later on. However, curiosity got the better of me. 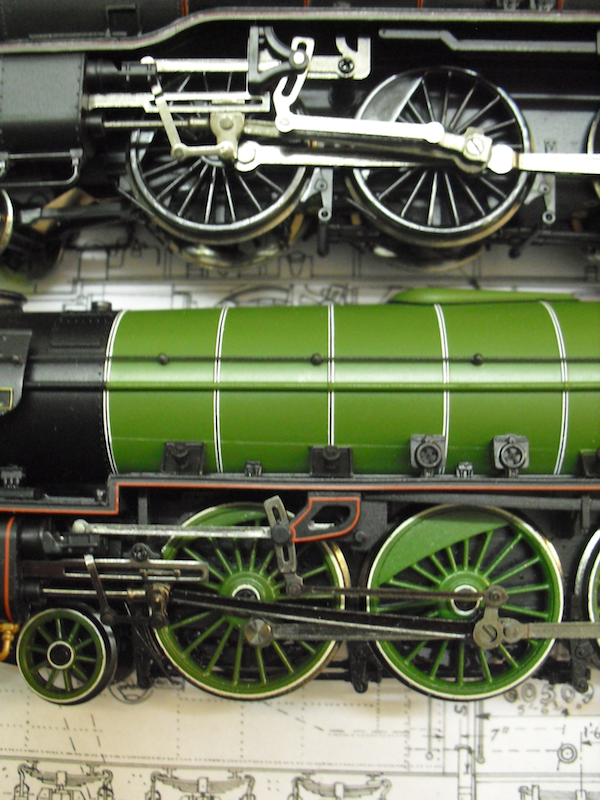 The resin components you can see are from Graeme King's range (you can find them for sale on the LNER Forum). The smokebox is part of his A1/1 kit, and the running plate and smoke deflectors are from the A2/3 kit. 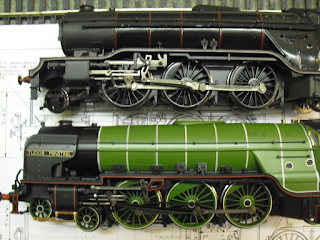 These kits were designed to work with the Hornby A3 and the Bachmann A2 RTR models. Graeme is in fact working on a very accurate A2/2 and A2/1 set of resin kits at the minute, but I'm not as bothered as I thought I'd be about the misshapen Bachmann V2 boiler as I have been previously. My previous modelling exercise with the latest Bachmann V2, 60903 (seen in a photograph later in this blog entry) was much improved in terms of the overall look by replacing the dome cover. This was the turning point for what is probably going to turn out to be a moment of madness! So, in the next stage of investigation, here's my 4mm Isinglass drawing of an A2/1, one Bachmann A2, the cut up Bachmann V2 bodyshell, complete with Graeme's resin castings. Now for the so-called tricky bit. Which turns out to not be quite so tricky! The steps below the cab are too far forward. However simply removing the box between the cartazzi and the steps, and then filing down the steps - and the rear extrusions on the chassis - gives the correct length chassis for the A2/1. Further modifications that will be required are removing the inside bracket for the Cartazzi wheels, allowing the bodyshell to sit firmly on the chassis. 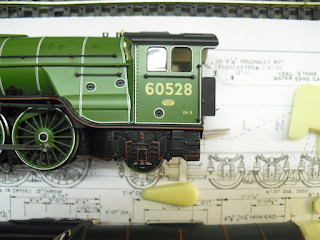 Adding a set of Hornby's cab steps from their A3 cartazzi (available as a spare easily) gives you the correct steps in the right position. So the rear of the locomotive can be dealt with fairly easily, and without removing the attachment point for the tender coupling. 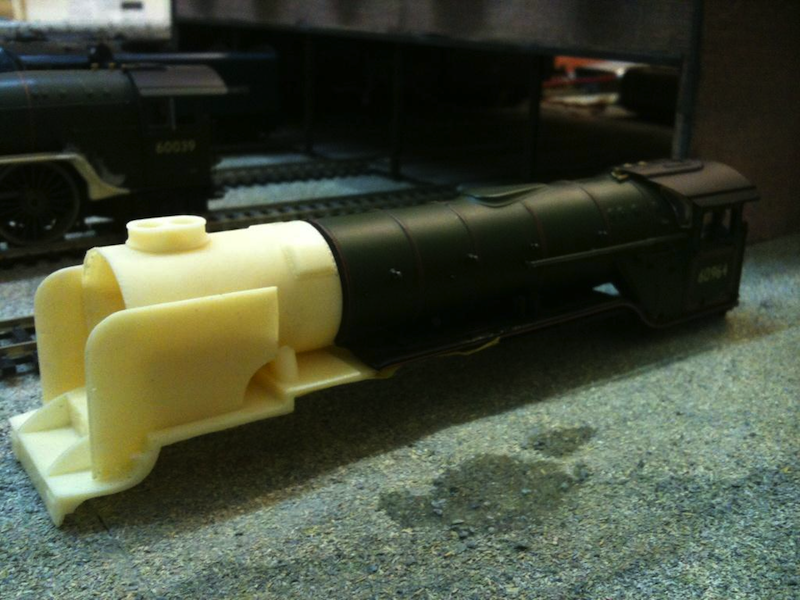 This is important, because using the latest Bachmann V2 model as a source of parts, you can simply attach the tender (now with the standard attachment points as per A1 and A2) without any modifications. 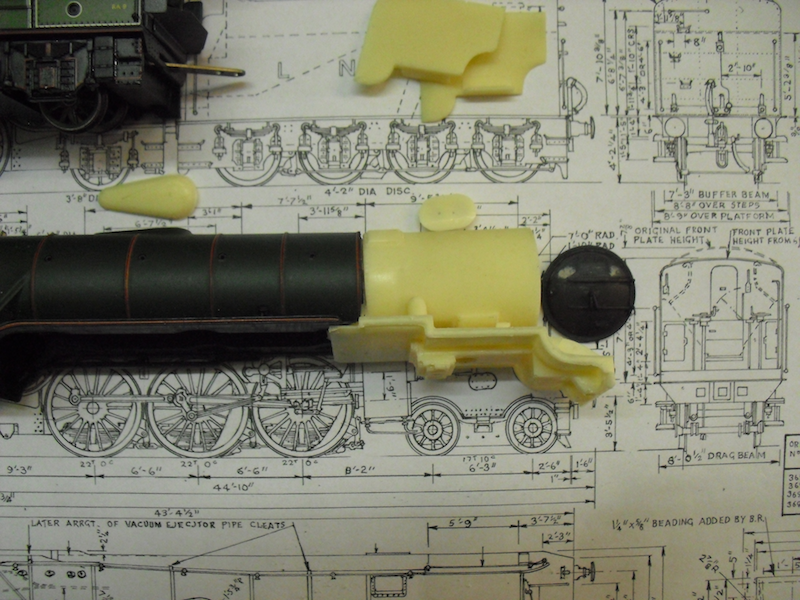 On the face of it, there's very little which needs to be done to make an A2/1 from a Bachmann V2 bodyshell. 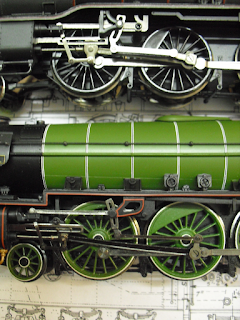 The A1/1 kit's smokebox - which is standard to A2/1, A2/2, A2/3 and A1/1, incidentally - combined with the A2/3 kit's running plate give the correct length, shape and details for a full length A2/1 bodyshell when combined with the Bachmann V2 bodyshell, sans smokebox and front running plate. You an also see above the V2 bodyshell, one of Graeme's excellent dome castings, intended for the A3 but suitable for V2, A2/1, A2/2 and any other locomotive so fitted with specific boilers carrying them. The smokebox door is a spare from a Bachmann A1 and is the right type (being the same casting as the A2 model). 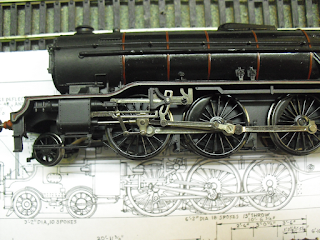 Now for the valve gear. Bachmann have used some parts standard to their A2 and A1 models, which will make swapping over the valve gear from the longer A2 connecting rod type to the V2 much easier. 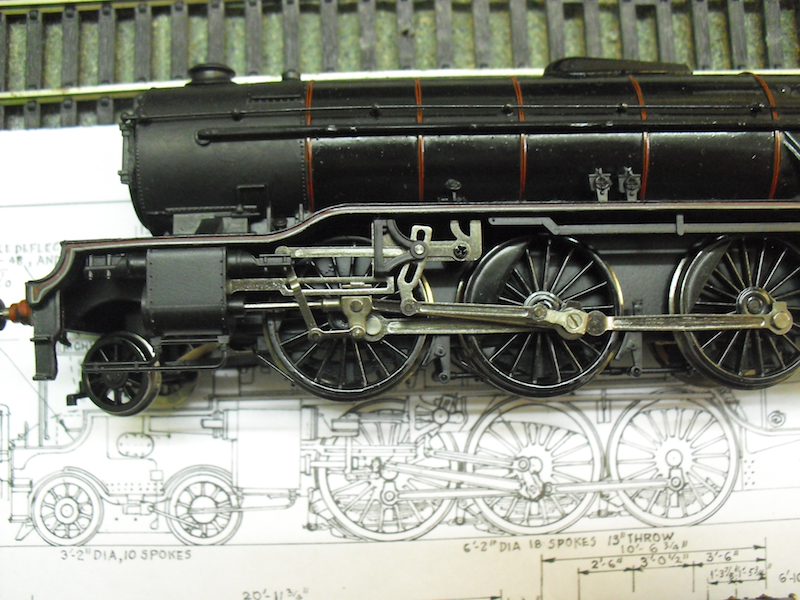 Now in theory, the valve gear should fit the A2 cylinder without modification and run perfectly. 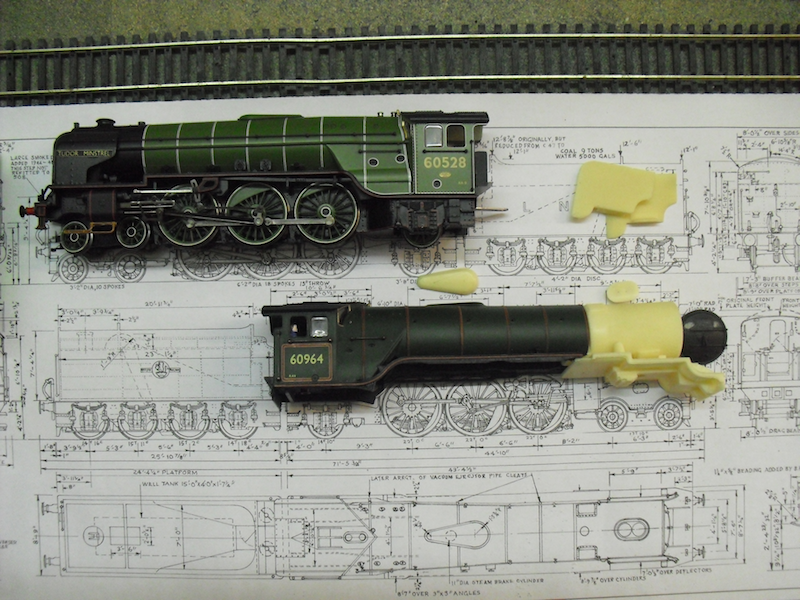 I have tested this with an older style of V2 valve gear when fitted to my A2/2 model (coincidentally, made in a very similar way to how I anticipate the A2/1 will be built. Side by side comparison. You can see where certain parts of the two model's valve gear are standard between them. The great thing about the new V2 valve gear is that only needs unscrewing from the centre driver and the bracket, and lifts out as all one piece with the slide bar too (unlike the older split chassis which had a plastic slide bar prone to warping).